An underground labor market provides abundant employment opportunities for undocumented immigrants in the United States. But working in the shadows often means accepting low pay and exploitation. Though it's illegal, brothers Israel and José Martinez have no shortage of work, moving from one construction job to the next in the ongoing building boom of Central Texas. They’ve worked on homes in affluent communities along the Upper Colorado River and renovated sprawling apartments in North Austin. They were on a crew that erected a new health center at a high-end retirement community, and as expert masons have built luxury pools, interior chimneys and backyard grilling stations. Their compensation often falls below minimum wage. They might receive just $90 for a 14-hour workday, or about $6.42 an hour — and that’s when they do get paid. On more than a few occasions, the brothers have gone days, weeks and even months without receiving payment for their grueling labor. This is the economic and social reality in which the brothers, and millions of other unauthorized immigrants, find themselves — a country so reliant on cheap labor that substantial portions of the economy are built largely on the backs of immigrants willing to do work most Americans won't, and for lower pay. The United States, and Texas in particular, has beefed up border security in recent years to keep immigrants out while paying less attention to one of the main factors drawing them here: There are almost always jobs waiting for them, even if securing and maintaining those jobs becomes a test of physical and emotional endurance. Various loopholes, backdoors and private arrangements allow undocumented workers and their employers to skirt the prohibitions on hiring workers illegally. Workers pay hundreds of dollars for fake Social Security cards or other documents to show employers, or they work as independent contractors so they don't have to show any documents at all. Employers aren't required to verify the authenticity of documents they are shown or obligated to check the immigration status of independent contractors. Santoyo says he worked at the Sonic Drive-In at the edge of town on Highway 287. He says he held jobs at McDonald’s, a pizza joint and the Home Depot distribution center before it relocated to South Dallas. He also worked for a few months one Christmas season at the famed Collin Street Bakery, a mainstay of Corsicana known for its fruitcakes. “There’s always opportunities for undocumented labor,” Santoyo said. Those opportunities are the very things on which the Martinez brothers pinned their hopes for a better future when they left their home in Mexico. 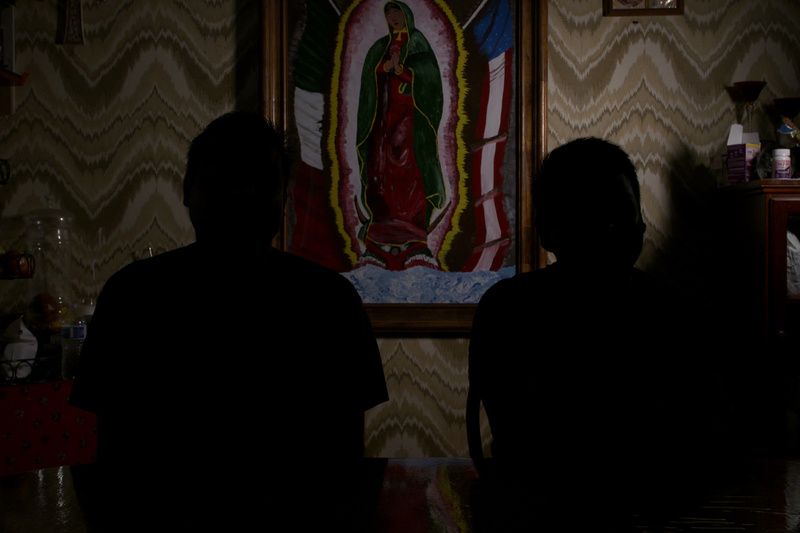 Sitting at their kitchen table beneath a painting of the Virgin of Guadalupe flanked on either side by the American and Mexican flags, the Martinez brothers recounted their perilous journey from Cuernavaca, Mexico, to Central Texas — a trek in which they endured the bitter cold of desert nights while dodging venomous snakes and malevolent strangers who prey on the multitudes of migrants headed to the United States in search of economic opportunity, safety or both. That river is the Rio Grande, which they crossed illegally to reach U.S. soil, and here is Austin, Texas, where the brothers, along with their father, have lived and worked since they arrived in 2004. Of the 11 million unauthorized immigrants in the United States, an estimated 8 million were working or looking for work as of 2014, according to a recent analysis by the Pew Research Center. In Texas, 1.1 million unauthorized immigrant workers made up 8.5 percent of the state’s total labor force, concentrated in industries like agriculture, hospitality and especially construction, where an estimated 25 percent of workers were unauthorized. Researchers at the Workers Defense Project and the University of Texas at Austin put that number even higher, finding that half of surveyed construction workers in Texas said they were undocumented. But first they have to get past the laws that forbid their being hired. For many undocumented immigrants, that path forward is through fraudulent documents. It’s not always an easy decision to use fake documents, but for many, it’s the only path they see to earning a living. “I had to work,” said Isabella, 33, who arrived in the United States when she was just five and says she got her first job at a Dallas Jack in the Box at age 16 to help her parents make ends meet. Isabella asked that her real name not be published for fear that public knowledge of her immigration status would affect her business as a real estate agent for a large Dallas-area firm, a position she can legally hold as a result of President Barack Obama’s 2012 executive order granting relief from deportation to young undocumented immigrants. Fake documents are not cheap, especially for folks subsisting on substandard wages. They can cost anywhere from a few hundred dollars to nearly $1,000. But some undocumented immigrants pay a much steeper price for using fake papers. Gerardo Vera was convicted of fraud after using someone else’s Social Security number to get a job at a New York restaurant. He served two years in U.S. prison and was deported to Mexico, but not before paying $5,000 for an attorney to fight the deportation order so he could instead be granted “voluntary” removal — an outcome that would allow him to eventually return to the United States. He did not prevail, despite his pleas to the judge. He said he didn’t know if he’d be able to rejoin his wife and children, as he would face even more prison time if caught trying again to illegally enter the United States. Those who can’t get fake documents or who fear the legal repercussions of doing so are often hired completely off the books. That’s how José Luis Zelaya, 29, got most of his work growing up in Houston. “It wasn’t like I went to places and applied for jobs because I was always very afraid of using certain types of documentation because there was a fear that [immigration enforcement] would go after me or my mom,” said Zelaya, who fled poverty and violence in his home country of Honduras when he was 13. Instead, he found informal work at a Mexican restaurant, earning $30 a day to work the door and run the register. He then moved on to mowing lawns, where his pay inched up to $40 a day. Undocumented immigrants also find work as independent contractors — a common tactic in construction but by no means unique to that industry. “The employer does not have an obligation to check the work authorization of someone that they engage as an independent contractor,” Beardall explained. Complex subcontracting arrangements — in which the primary company on a project contracts work out to a second company, which then subcontracts to a third, and so on down to the individual workers — are a central practice of the construction industry. Subcontracting provides a way for general contractors to hire specialists in specific trades, like carpenters or electricians. But such arrangements also allow the companies at the top of the chain to circumvent responsibility for using undocumented labor or abuses that may occur further down, such as wage theft. 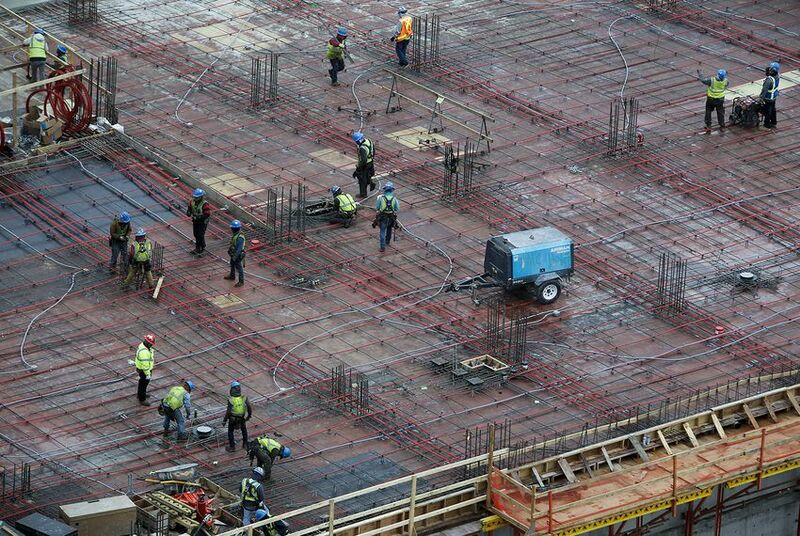 “Construction workers, especially those who are immigrants and especially those who are undocumented immigrants, are very vulnerable to not getting paid at all for their work after they've worked on a job,” Beardall said. It’s a scenario the Martinez brothers know all too well. In 2009, when they were working on the retirement community’s health center, the subcontractor who hired them stiffed them for what Israel said was $2,400 worth of work. They found out the subcontractor had already been paid but was holding out on them. The Equal Justice Center took up the brothers’ case and filed a mechanic’s lien, a procedural device that can bring a halt to work at a site until a dispute can be resolved. They recovered what they were owed. A similar thing happened the following year when the brothers and dozens of other workers were renovating and adding stone to the exterior of a large apartment complex in North Austin. For weeks, their supervisor promised to pay them but never delivered. When the workers threatened to stop working, the supervisor threatened to call the police. “We told him that he could do as he pleased but that he had to pay,” Israel said. Through the help of their lawyer, and another mechanic’s lien, the brothers and 44 other workers recovered their wages. In a sense, Israel and José have been lucky, despite frequently running into dishonest bosses intent on cheating them out of their pay. They continue to find work, and when they feel they’re being exploited, they move on to another job. Some slightly more fortunate undocumented immigrants find the means to cobble together enough money to start their own businesses. After working years as a restaurant busser and server, sometimes for as little as $30 for 12-hour days, José Sic opened his own business. 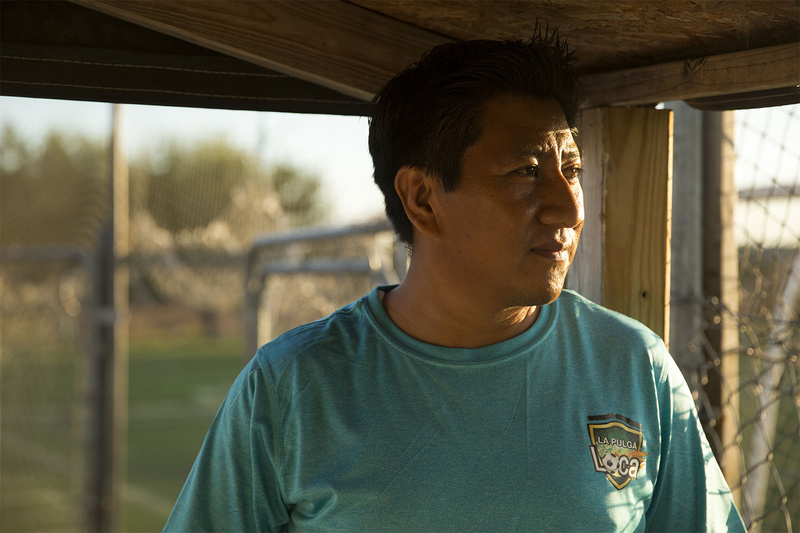 “It is a soccer field, where families can come and have fun, come and play,” said Sic, 39, who hasn’t returned to his native Guatemala since he left in 1996. Though it’s illegal to employ undocumented immigrants like Sic, there’s nothing specifically barring him from operating a business. He rents the land for his soccer field and charges customers a small entrance fee. It’s an uplifting sentiment, one shared by many undocumented immigrants striving to carve out their own niches in the American dream. But there’s a counterweight, a bitter truth that runs through the minds of all who entered this country illegally: The fear that at any moment they could be forcibly uprooted and sent back to the countries from where they came. For Isabella, that fear didn’t come so much from working illegally. “I think I had more fear about driving without a license,” she said, remembering a time when she narrowly avoided arrest after getting pulled over on her way to work. It was experiences like that — the day-in, day-out of being undocumented — that took an emotional toll on Isabella. But the prospect that President-elect Donald Trump will follow through on some of his campaign promises means Isabella, and others who benefited from Obama’s relief from deportation, may be relegated once again to the shadows. Trump has promised to repeal the executive action, known as Deferred Action for Childhood Arrivals, or DACA, within his first 100 days in office. DACA recipient José Manuel Santoyo hasn’t been to his birth country of Mexico since he left in 2001. He is about to graduate from Southern Methodist University and intends to go into politics. But losing DACA would put that dream on hold. That anxiety for what the future holds permeates beyond these young immigrants throughout the entire undocumented community. Gerardo Vera, an undocumented worker from Mexico, was deported after he was caught using someone else's Social Security number to land a job. Jay Root and Elena Mejia Lutz contributed to this report.